A limited edition artists' book. Printed two colours using traditional letterpress techniques and hand-bound. The book theme explores the limited use of time within today's society – therefore each page gets incrementally smaller to suggest the passing of time. 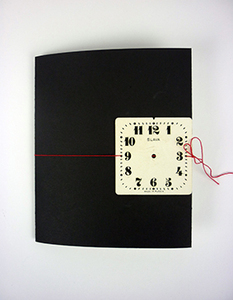 This artefact has been purchased by Oxford Brookes University for their Artists' Book collection. This artefact has been purchased by the Centre for Fine Print Research at the University of West England for their Artists' Book collection.